I love the interesting guests, humor and insights on a wide range of topics, including diet, writing and more. Host is a good thinker with lots of great ideas and advice about each topic. He displays good knowledge of scientific skepticism and critical thinking skills, which is a must for me in any "advice" podcast. I found James thru an amazing youtube talk. But who's the woman co-host? The wife? She's got a nails-on-the-chalkboard voice with a too-thick accent and then she has nothing to say. Take, for example, the suicide program they did. Her mother committed suicide, and so she thinks she's an expert on all aspects of depression. Then they both recommend consulting psychiatrists--who are inept and corrupt. Then James starts pushing the debunked theory of "brain chemicals" and need to be "definitely medicated". Medications are dangerous. And he's essentially prescribing them. He's not uptodate. Makes me wonder what else he's wrong about. The woman has an angry voice and starts barking about cynicism not being intelligence. But one must be skeptical about antidepressants. Very irresponsible episode. Iâve listened to 95% of the episodes, and I love the advice. Also there are no ads, and there is an occasional laugh every now and then! I learned about James thru his answers on Quora and felt he has quite the way with words. His perspective and insight are always intriguing to me and get me to think. I've enjoyed the guests on his podcast and the questions he asks. Makes for wonderful and intellectually stimulating listening! Iâve listened to every podcast James has made and have tried others. Heâs simply the best. Not only does he read the books of the authors he interviews, making him informative and to the point, he has humor. Heâs quirky, authentic and smart. A great combination. I am listening to this podcast every day in between when I have a break. It gives great, actionable advice! I loved this podcast. James and Claudia are so good together. Please make more episodes! This show dissects many questions we all have. Mr Altucher mixes in his many wisdoms including his famous "daily practice" which has been life changing for me. I would recommend this and his other podcasts to anyone that wants to improve their life and learn how to live the life their dreams. Just started listening to "Ask Altucher" from a few weeks ago and I have been binge listening ever since. I feel like I've found in "Ask Altucher" an internet mentor that gives me "just the facts", without the psycho babble, on wide ranging relevant topics. His podcasts are short and to the point; laced with his true life, good and bad experiences. Thank You for the great podcast and keep it coming! No words really can describe how impressed I am with the James and Claudia duo. All they've overcome and how generous they are with their wisdom. I love it and Can't. Stop. Listening. No one cares as much as james. No one cares about you. James does. He gives and gives. Buy his books. read his blog. It will change everything. I love this show and James' other, longer-format The James Altucher Show. James is such an original thinker, going well beyond just being a contrarian, as his insights go anywhere from 1 to 359 degrees away from the conventional wisdom. I find myself wondering regularly what his take will be on an issue. I consider both of his shows must-engage content. You have to process his shows, not just passively listen. Itâs like having coffee with your smartest, most generous, favorite friend every day. One of my few can't miss podcasts. Very short but also informative. Keep it up guys. My question, who can bench press more, James or Claudia? That is what you will get. They have done it, are doing it and give advice and help as we are all walking through it. Iâm hooked. I listen to this podcast everyday. I was searching for someone with similar views as mine and I found him. James is raw and honest. Just my cup of tea. I love listening to him! It's so incredibly rare to find honest and open voices like James' and Claudia's these days. "Ask Altucherâ allows us to pick the brains of this talented couple. Their dynamic together is fantastic - loving, funny, and they bring out the best in each other. I haven't found another podcast like it. I listen every single day and always learn something new. This is exactly what I need at this point in my life. Thank you, James and Claudia, for giving us this wonderful gift! James has nailed it with this podcast, always interested to hear what he has to say on Ask Altucher. James and Claudia have great chemistry. The answers are well thought out and the 10 ideas a day practice has been phenomenal for me. So much so that I am shooting my first feature length film (a comedy about the Delta blues) using a lot of the ideas that were sparked by the ten ideas practice. PS- jeez iTunes why is it so difficult to rate something? I should be able to rate a podcast as I am listening. This search then rate garbage is a hindrance to good podcast. You're dropping the ball Apple. James, I wish you were my friend back in grade school. You seem like someone I would really enjoy. Smart mischievous, caring, authentic. I listen to your podcast every day. I learn a lot and I laugh some more. I don't have a good relationship with my dad so you're like a mentor figure in my life.like a favorite uncle. I know you say you enjoy making these podcasts and on top of that you make a difference in my life so thank you. I look forward to giving back to you somehow someday. Why You Should Subscribe Today! Ask Altucher is by far the best unconventional business daily podcast out there. You'll be given so many profitable ideas and motivation each day you'll need to write them down to remember them all. You'll also be anticipating the next day's release. James even gives his cell number so you can text a question to be answered on the show.But here's the real secret to what makes the show awesome: While James is scary smart and his enthusiasm is uniquely contagious, the real star of the show is James' wife Claudia. She is also an idea machine and a successful entrepreneur, business owner, and published author. Their personalities contrast in magical ways like peanut butter and jelly. James is chess geek meets computer code cruncher meets business madman. He's the peanut butter. Claudia is yoga girl from Argentina meets New York and exudes an extremely elevated level of cool, hip, power into the show. Obviously, she's the jelly. Subscribe today and see what I mean. Then tune in, take note, and be happy as your life gets better along with your bank account. Well, that might be a bit of an exaggeration. But, the advice that I get on ask Altucher, gives me the little nudge I need to keep on my path. Thanks for providing that daily inspiration that helps me get over the hump. An abundance of excellent topics and strategies for improving your life, your business, or anything you want. It has inspired me to take my life in challenging new directions! I have been following James' writings for a while and have greatly enjoyed his wisdom! I love his advice, stories, and that he really connects with people. The more I listen and really try to integrate these ideas, the better things become. Thank you for all you do! Thank you to Claudia as well! I love hearing your insight on the show! James and Claudia Altucher are excellent at sharing their ideas on how to build a better life for yourself. Their podcasts are just long enough to listen to and act upon their advice and ideas immediately. They are lovely to listen to and you'll love them too. Enjoy, and choose yourself! I enjoy listening to Claudia and James. I recently got fired from my job so what better time to launch a biz. This podcasts keeps going in the right direction. Thanks for the great advice. Will change your thinking and your life. I have heard almost every podcast and still eagerly await the next. James and Claudia genuinely care about their listeners and provide incredible resources and inspiration. They get the big picture of life. Mr. Altucher.... The answers that I never thought I would ever get, and get for free. Such a wealth of knowledge for all to enjoy...Thank You. You are a great human being.. While I enjoy and am usually intrigued by the podcast, I have to agree with the previous two comments. The point is to hear James answer questions, but his wife Claudia spends as much time talking as he does. Much of the time she interrupts him and it is so annoying. I would suggest she get her own podcast since she has a lot to say.. I'm sure it too would be interesting and I would check it out. But this is set up as a format for James to answer questions. Leave it at that and it's terrific! I'm not really sure how I stumbled across these podcasts but I love themâ¦ I've been cherry picking and listening to all of the ones that seem like they will be worthwhile, and each one certainly is. It's really awesome that each of these is in a nice bite-size chunks and not an hour-long podcast. The guy is great and has awesome informationâ¦ But sometimes the woman comes off as if she is the expert that is sharing the information and sometimes even a little criticizing of what she feels the general public does or wants to do. It would be nicer I think if it was more of her interviewing him and asking him questionsâ¦ And not so much of her jumping in as if she feels she's the expert. Or maybe if her personality was a little more like someone who is trying to guide and nicely share information, very much how he is like, it would be easier to listen to her. Also she interrupts him a LOT. But in general these are very informative podcasts!!! Claudia, as a dedicated listener from day one, I'd like to request that you please stop interrupting James mid sentence and/or talking over the top of him with your often silly and/or opinionated remarks, like many wives feel called to do. A good interviewer ASKS a probing question to draw out the wit and wisdom of the interviewee--which, after all, is what many people tune in to hear--James' wit and wisdom. Since Aaron is no longer the interviewer, I feel as though I'm listening to the Regis and Kathy show each vying for a spotlight and audience favor. Perhaps you could simply ASK the question ala 'Ask Altucher' and then remain silent until presented with a pause from James during which you ask a related and more deeply probing relevant question to elicit more of James' point-of-view, wit and lessons of personal experience. Thank you!! Variety of themes all hit home! It's true, I'm late to the party that is the Ask Altucher (Q & A) podcast, but I'm thrilled to have 'discovered' it, nonetheless. I also enjoy listening to The James Altucher Show. The Altuchers provide thought-provoking content that's also actionable. Claudia Altucher is a breath of fresh air, too. Fresh but not crass-that's rare. James Altucher has been one of the best things to happen to my current 22 year old life. His daily practice, the idea machine concept, and just keeping it REAL. James truly believes in being charitable knowing that heâll be repaid in the future. He has really good top-of-mind decision-making skills, abilities to give examples, and give clear thoughts about any given scenario. Not to mention that Claudia (his wife) is the most perfect co-host! Life changing, every 6 months! 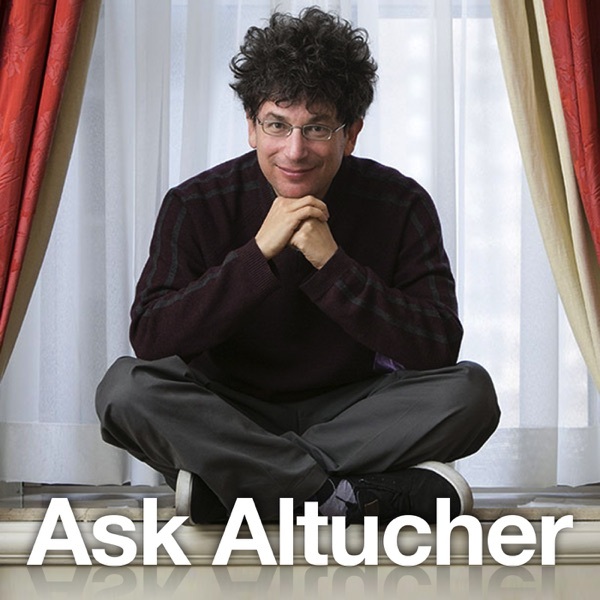 I've listened to EVERY episode of the Ask Altucher show (250 now! ), and I hope James and Claudia will be keep recording these forever. My life has changed every 6 months, for the better, since I started my daily practice. This is my #1 podcast on the web; I get my daily dose of inspiration, creativity, and life hacks âin-a-boxâ delivered to phone.